Coming soon! The Card & Dice Fantasy Gladiator Game. and get 25% off of your entire order! How soon and is this gonna be a kickstarter again? Later this year on Kickstarter. 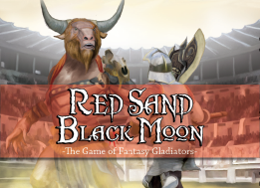 Offering two games, Fantasy Gladiators and Historical Roman Gladiators. 25% Off _ Last sale of the year - last 2 days!